David Grenewetzki, also credited as Dave Grenewetzki and often going by the nickname Greno, is a former employee of The Software Toolworks. He served as the company's Chief Technical Officer, Sr. Vice President and Director of Software Development, and was specifically in charge the entire Mario's Time Machine project. After The Software Toolworks, he held high corporate positions at several gaming companies, including Accolade, Sierra Entertainment, and Irrational Games, before eventually becoming the executive chairman of AlterG, a medical device company that specializes in anti-gravity treadmills. Within Mario's Time Machine itself, he appears as a physical character who meets Mario after the latter travels to Novato in 1994. 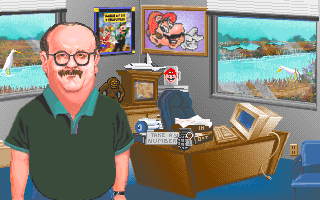 According to Mario's Time Machine, David Grenewetzki was working at The Software Toolworks in a corner office Bowser steals the Floppy Disk holding the final version of Mario's Time Machine and Mario travels to the headquarters to return it. However, as Mario does not know that the disk needs to be brought to Grenewetzki, he questions several other employees about it, including Andrew Iverson, Don Lloyd, Jeff Griffeath, and an unnamed quality assurance person. Both Iverson and Lloyd tell Mario to bring the Floppy Disk to Grenewetzki, and the QA elaborates on Grenewetzki's role, saying that "He’s the main man. The big cheese. The top banana. Numero Uno. El Cid. #1 on the runway... He’s got a corner office and the power to use it!" If Mario talks to Grenewetzki without confirming the disk's owner, Mario asks him where he is, and Grenewetzki confusedly tells him that he is in Novato, California, before telling him that he has lost the the final version of the company's edutainment product and that he needs to look for it. Eventually, Mario absolutely confirms who the Floppy Disk needs to be brought to, and finally asks Grenewetzki if he is looking for the disk in Mario's possession. Grenewetzki excitedly and quickly recognizes it, and he tells Mario that they are now able to ship the game to "stores everywhere". He asks for Mario's name, but when Mario replies that his name is "Mario Mario", he does not believe him. He sarcastically replies that he is William Shakespeare, and tells Mario that he needs to go to a business meeting while sarcastically asking him to say hello to Luigi, all the while laughing. Mario then leaves him be to confront Bowser once and for all. Grenewetzki's LinkedIn profile ends with "dgreno" - a unique URL based on his nickname. † Exclusive to the NES release / * Exclusive to the DOS/PC releases. / ** Exclusive to the Deluxe release. This page was last edited on September 7, 2018, at 03:50.